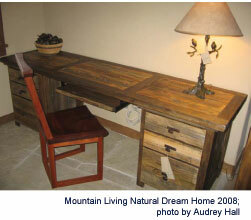 Even in this challenging economy, sustainability and green manufacturing are still hot topics in 2009 says Mountain Woods Furniture. Green thinking, they add favors American furniture manufacturers, since transportation is a large factor in the carbon footprint of a heavy product. Locally-produced furniture not only puts more Americans to work, but it also has an intrinsic advantage for green consumers. 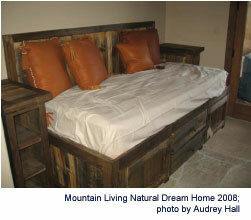 For this reason, USA-built furniture was primarily selected for the 2008 Natural Dream Home project sponsored by Mountain Living magazine. 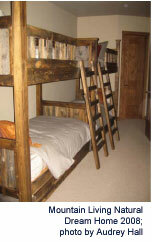 American-made reclaimed furniture was featured in a few of the rooms, and one of the most popular bedrooms featured the Wyoming Collection™ from Mountain Woods Furniture®, based in Laramie Wyoming. In selecting this furniture, the Mountain Living Dream Team was not only impressed with the beautiful designs and meticulous craftsmanship, but they recognized the manufacturer’s long-standing commitment to green building practices. As a Founding Member of the Sustainable Furniture Council, Mountain Woods Furniture® made the commitment long ago to use mostly reclaimed or “dead-standing” wood, and where necessary, supplement those wood sources with sustainably-sourced, locally-harvested woods. Scraps from production are used to efficiently heat the facility during the long Wyoming winters, and they use low-VOC stain and water-based finishes, minimizing indoor air pollution. Nevertheless, all the green manufacturing processes in the world won’t help sell furniture if it isn’t well-made, beautifully designed, and durably finished. So, the Dream Team was thrilled to have their judgment confirmed when they heard praise heaped on the Wyoming Collection™ from the public and designers who toured the mansion during its many showings in 2008 and 2009. The final showing of this magnificent furnished mountain home was on January 31, 2009 at the Habitat for Humanity’s Gala Preview Party. Proceeds for the extravaganza were donated to Habitat for Humanity to build homes for needy families. Designers and retailers who are not based in the Rocky Mountains will be able to preview the Wyoming Collection™ and the full line of Mountain Woods Furniture® designs at the Las Vegas World Market Center, February 9-13, 2009 (Building C-Floor 13, Lodge Living, Suite C-1376M/N).